Engineering Design 3: Checkbook covers design descriptions and problems concerned with the automobile industry. The book starts by discussing the main factors that influence the choice of materials, such as mechanical and physical properties, manufacturing processes, anti-corrosive properties, and availability at low cost. The text describes the influence of manufacturing processes; costs; and ergonomic, safety, and esthetic factors on the design and the design detail. The main points relating to simple link and rotary mechanisms, including their terminologies and definitions, practical applications, and motor conversion, are also considered. 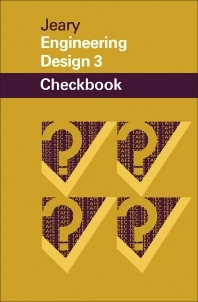 The latter part of the book tackles the main points concerned with design evaluation and preparation (i.e., the importance of developing design appreciation and design comparison, process and modification). The book provides design assignments and worked problems together with the answers to the given problems. The text will be invaluable for engineering students.